American roots rockers Donna the Buffalo and Peter Rowan have teamed up with Ben & Jerry’s cofounder Ben Cohen for a tour they’re calling “The Stampede.” Designed to raise awareness about the inappropriate use of corporate money in politics, the tour also promises to be great entertainment. 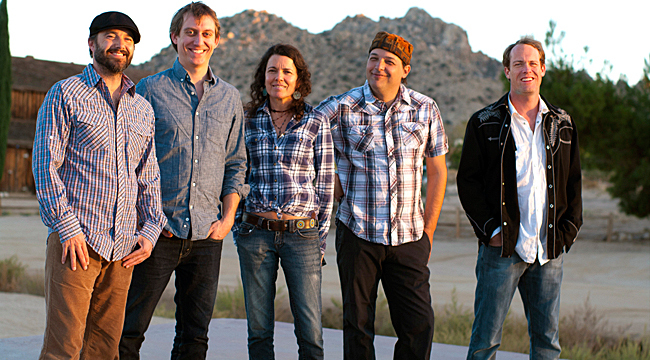 Famous for playing bluegrass with elements of Cajun/zydeco, rock, folk, reggae, and country, Donna the Buffalo has actively toured for the past 25 years. We spoke to singer-multi-instrumentalist Tara Nevins as she drove to upstate New York to meet with the band for the start of the tour. For these shows, Rowan plays solo for about 45 minutes then Donna plays a set with Peter joining in toward the end. What inspired the concept behind the current tour? We met Ben Cohen a while back. He’s been running this campaign for a while now. We brought him down to our [Virginia Key] GrassRoots Festival of Music and Dance outside of Miami and he did a presentation there. We liked his message. He’s been trying to spread the word. We thought it would be an awesome thing to do and we could do a tour with him. We want to play a show and spread the word. Ben thought it was a good idea too. It’s been months and months of planning. It’s very timely, of course, with this election coming up. What’s the message of The Stampede and what are the rubber stamps sold on tour about? Corporations are not people and money is not free speech. It used to be that a private party could donate no more than $2400 to a candidate and a corporation wasn’t allowed to. That all changed in 2010. Now, there’s no cap. It’s gotten out of hand. If you are a member of the elite, then you gain unfair access and influence which leaves the people’s voices behind. In true democratic form, it’s unfair. The amendment needs to be changed. Ben is trying to spread awareness. He’s using money to get money out of politics. The stamps say different things and you can stamp your dollar bill. Dollars get into rotation. It’s like free advertisement or a traveling billboard. It spreads the message that way. It’s a very cool idea. It’s a very good time for it. We’re not an overly political band. We just speak to positive energy toward human potential, not so much toward political messages. This is about the rules of basic politicking. We’re not endorsing a candidate. It’s about the basic fundamental rules of what’s wrong and right in a democracy. All these rich people should not be able to write five million dollar checks and get favors that go against the environment or a human right. This tour is going to be inspiring. It’s going to be a party on wheels. People just want entertainment. I understand that you want to leave the day behind. We don’t want people to shy away from this. It won’t be dogmatic. It’s just a good message and we felt like it was something we could get on board with. We’ve been playing a long time and it’s good to come across something new to sink your teeth into. You toured with Peter Rowan some 15 years ago. What was that experience like? Peter is a legend. He’s an amazing talent as far as his singing and playing goes. He’s written some of the most timeless bluegrass songs. It’s a big deal. He also is a very cool guy. He’s a free spirit. He’s an open vessel. Cool things come through. We’ve toured with him before and have a great time playing music together. We’re on the same page. He’s an enjoyable person to be around. He’s an inspiring guy. He’s a friend at this point. Talk about the band’s origins. What first brought you together way back in 1989? The band came together not on purpose. Jeb [Puryear] and I met playing old-time music. We still go to fiddle conventions. We’re still in the traditional world. We’re part of that community. Somewhere along the line, we started writing songs. And at some point, we transferred to electric instruments. There we were playing electronic instruments playing songs we wrote. We just said, “Let’s do a gig.” It evolved spontaneously. We never said let’s write songs and have a band and go on the road and do this for 25 years. It’s where our path naturally led. We’re still connected to the old-time music. We have four festivals. We’re a well-oiled machine at this point. We never thought about it. We never had a discussion about it. It’s just what we do. We started festivals and played different events. I don’t think bluegrass was that popular when the band started. How has it regained its popularity? Jeb and I play traditional music. We play old-time fiddle music. It predates bluegrass. It’s what bluegrass and Bill Monroe evolved out of. It’s all in the same family. One of the reasons for the spread in popularity is because of the rise of the festivals. When we started 25 years ago, there is no comparison. It used to be that you go to a few festivals in the summer. Now there are festivals every weekend of the summer. It’s a festival world and because of that people are exposed to more types of music. These festivals used to be very homogenized. A bluegrass festival only had bluegrass. A folk festival only had folk musicians. A rock festival only had rock bands. Now, festivals have all the genres. You hear bluegrass, old-time, jazz, country. It’s all under the same title. All kinds of music are acceptable to people. Bluegrass fans have taken it to another place. A band like Yonder Mountain String Band does that. It’s been evolving. You also have social media spreading all types of music. At a certain point, people do get tired of what they hear on the radio. They’re excited about the other music. The level of musicianship in bluegrass is great too. How’d you end up playing zydeco? We played traditional fiddle music and when you play that music as long as we have, you appreciate other types of traditional music. We’ve been fans of Creole, African and Irish music. We got involved with the music of Louisiana about 25 years ago when the band was first starting. A few of us traveled spontaneously to Mardi Gras in Southwest Louisiana. We discovered up close and personal that community, tradition and culture. We fell in love with it the first time we heard the fiddle. I was inspired and bought a couple of accordions and started learning to play that music and then just incorporated it into Donna the Buffalo. We started a new record. It’s waiting to be finished at the moment. We have been touring. We needed some time off. We’ve been working on organizing The Stampede. That has taken a lot of time and it has taken us right up to the holidays. We’ll have a party in Florida for New Year’s. We go down to Key West and play there for a few days. We started at the Finger Lakes. This July is the 25th anniversary of the Festival that takes place at Trumansburg. We are really busy. You are still enthusiastic about touring? It’s an amazing thing. As far as the festivals go, there is an amazing crew of people. We can’t put on four festivals a year by ourselves. Jeb’s brother Jordan Puryear was initially in a band. He quit the band to do other things. He wanted to have more than one festival. He has been leading the charge to find places to hold more GrassRoots Festivals. We do a lot of stuff. There’s a New York crew and North Carolina crew and a Miami crew. There are overlapping crews. There are people who dedicate their time to the cause. We love festivals and we play so many and it’s growing. They’re all growing and have wonderful energy about them. We’re fortunate in this day and age when bands are struggling to keep it going and stay on the road and put gas in their vans. We can go on the road and have families that support us and wives or boyfriends who are okay with us being gone. It’s hard to navigate but we’ll all really dedicated to it.